Like most successful poets, Denise Lajimodiere has always enjoyed and possessed an aptitude for writing. When she was young, her creative writing teacher at school on the Turtle Mountain Reservation in Belcourt, North Dakota pulled her aside and encouraged her to pursue the craft. It wasn’t until the publication of “Love Medicine” by Louise Erdrich, who like Lajimodiere is a member of the Turtle Mountain Band of Chippewa Indians, that she understood writing could be a viable career. Today Lajimodiere is assistant professor of education at North Dakota State University and a published poet. This summer, Lajimodiere returned to her reservation to serve as a similar kind of role model for kids growing up there today. The Turtle Mountain Art and Writing Workshop, sponsored by the Red River Valley Writing Project (RRVWP), Turtle Mountain Community Schools, and Scholastic, gave Native American middle and high school students the chance to spend a week writing and making art with instructors on their reservation. 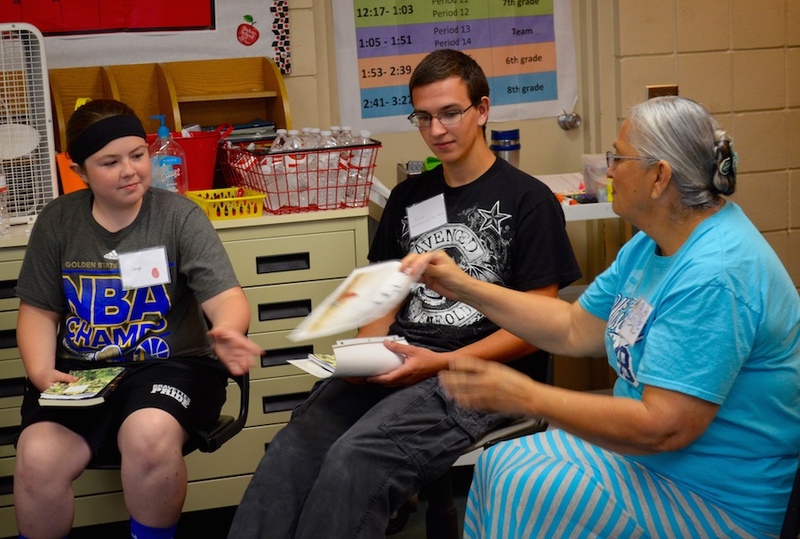 The organizers recruited 15 students from the Turtle Mountain schools for the inaugural workshop, held last July on the middle school campus. Workshop leaders encouraged the students to experiment with form and genre: flash fiction, memoir, photography, playwriting, even puppetry. While some students applied to the program because they already loved to write, others were looking for an alternative to their experiences in traditional English classes. Sassi had previously worked with Lajimodiere—both are professors at North Dakota State University—on a one-day workshop with Native students. She noticed how the poet drew on the cultural background she shared with her students to help engage them. Eighth-grader Jeryn Marcellais has always written for fun, and came to the workshop looking for mentorship, which she found in Lajimodiere. A voracious reader of young adult novels and “stories about love,” Marcellais said she liked the fiction workshops best. For other students, it was a particular treat to work with Mic Jordan, a Native rapper and hip-hop artist who graduated from their schools. His own music deals with racism and poverty, but he also shares messages of pride and youth empowerment. He led the students in an interactive workshop where they freestyled and made beats. The students also enthusiastically welcomed an outsider—16-year-old National Student Poet Weston Clark—to the reservation. The young poet led a workshop and wrote alongside the Native students all week. The jam-packed week culminated in a live showcase of the students’ writing and artwork. It was not an easy exercise for some of the shy students, but in the end they took on the challenge and read their pieces to a sizable audience. The students left the program with a book featuring one of each of their pieces and a $100 stipend. Plans are in the works for another event this summer.